ANN ARBOR, Mich., June 26, 2018 - Mechanical Simulation is pleased to announce the release of the 2018.1 versions of the vehicle dynamics simulation tools CarSim, TruckSim, and BikeSim. In a departure from past versions, this major release comes just six months after the previous major release in December 2017. In addition to vehicle math models and visualization tools, the simulation tools need to include multiple 3D road surfaces, other vehicles, and possibly pedestrians and/or animals. The software packages have been extended to fill these needs, with many new animation resources (walking pedestrians, pedaling bicyclists, running animals), road surfaces and paint markings, road signs, and other “props” that appear along a road. A tool called VS Scene Builder was introduced in the previous 2018.0 versions to build scenes with drag-and-drop to locate paths and objects. 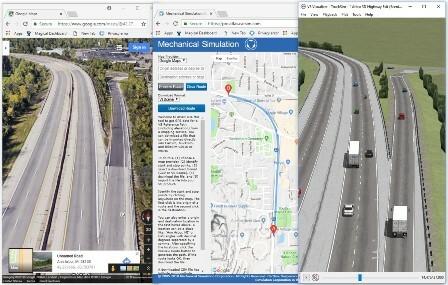 A web-based tool called Atlas was introduced a few years ago to download GPS data from mapping services such as Google in order to simulate existing roads and intersections. In preparing for the 2018.1 release, developers at Mechanical Simulation realized that with so many new tools, the overall improvements were fairly major. Although the new versions include many improvements in the vehicle models, improvements are perhaps more significant in the scenario-building tools and supporting resources. The new capabilities include: improvements in the Atlas tool to include GPS altitude along with latitude and longitude when downloading data; improved smoothing and editing of data when importing GPS data into CarSim, TruckSim, and BikeSim; and software improvements in VS Scene Builder (UnDo/Redo, dragging and dropping animator assets into the scene, access to global X-Y coordinates in scene). Although the most visible changes involve roads and scenery, the math models were also upgraded in many ways: connections to external software such as Simulink now support a “preview” option that eliminates lag between connected models; management of multiple roads and paths was improved to reuse datasets more easily; built-in sensors and moving objects have new features that simplify the simulation of traffic vehicles, pedestrians, and traffic signals. With the expanding role for simulation in an ADAS development process operating at an ever-accelerating pace, Sayers predicts that Mechanical Simulation will continue the practice of making major product releases at six-month intervals to maintain its leadership in the vehicle dynamics field. The Atlas web tool is used with Import options to reproduce the 3D geometry of a highway exit in TruckSim (I-94 exit 172 in Ann Arbor).